Reddit is known to be one of the biggest source of driving traffic towards your online business. A great aspect about being a Redditor is that you get exposed to a community that is willingly to be less spammy. Reddit was made to be the 'front page' of the Internet as first established by the Founders, and still does a great job in highlighting the best stories around the Internet. The platform is too simple to get your hands on. There is a simple up/down voting system that distinguishes featured stories that make till the front page of Reddit getting thousands of visitors inflow towards the source. While other stories don't even make up with in it's particular sub reddit. Sub Reddits, if you're wondering are sub categories. There are tons of sub reddits that you can follow and share socialize with. 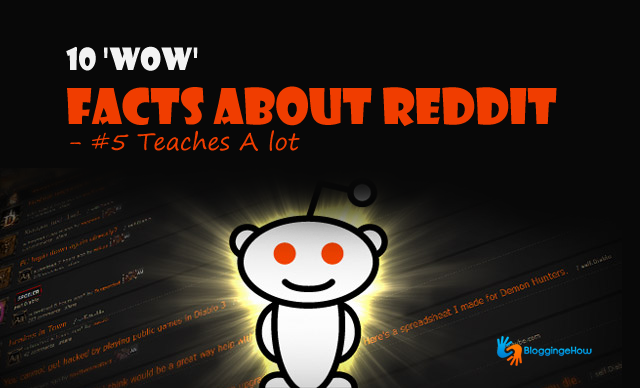 Below we have some of the greatest Reddit Facts that you'll certainly love. Founders Alexis Ohanian and Steve Huffman's first idea was 'MyMobileMenu' that was meant to be a takeout ordering app. Their lack of interest and laziness resulted in another project, that is Reddit it's self! Reddit is divided into 'Sub Reddits'. Many of them that you'll find feature pictures of birds with arms, and worshipping Nic Cage as God. Reddit holds the record for being the world's biggest Secret underground Santa. In 2012, 44,805 people from 130 countries sent gifts to each other via Reddit. The site was almost named Reddit, Popvox, Octopop, Obaloo or 360Scope. Snoo was also considered, but this name was given to Reddit's alien mascot instead. When Reddit launched, the founders set up fake accounts to make seem more active than it actually was so to not disappoint the first inflow of people on the platform. Since Reddit was founded in 2005, only $500 has ever been spent on advertising the site. Most of it's traffic comes in via viral routes or people sharing the content from all around the net. The entire budget was spent on stickers. Many sub reddits have caused controversy, especially that have racial content floating all around. In 2013, a sub reddit incorrectly identified innocent people as the Boston Bombers. There's a humpback whale named Mr Splashy Pants thanks to Reddit. Reddit's logo was changed to a whale and users chose the name on a Green peace poll. A CERN scientist who resembles Half-Life's Gordon Freeman was sent a crowbar by Reddit's users. It was to be used if the Large Hadron Collider ended the world. Reddit is fun and has users with demographics from 25 to 35 mostly males. Give a try to the platform and hopfully you can get some constructive use out of it.